55. Juxtapose the use of override with new? What is shadowing? A derived type shadows the name of an inherited type member by redeclaring it. 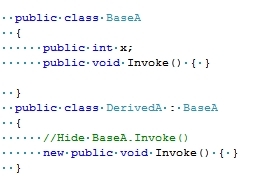 Shadowing a name does not remove the inherited type members with that name, it merely makes all of the inherited type members with that name unavailable in the derived class. The shadowing declaration may be any type of entity. In other words Shadowing is another name for disabling an inherited method and giving it a new definition. 56. Explain the use of virtual, sealed, override and abstract. When applied to a class, the sealed modifier prevents other classes from inheriting from it. In the following example, class B inherits from class A, but no class can inherit from class B. 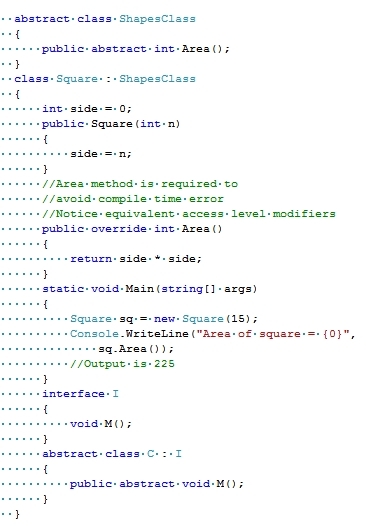 You can also use the sealed modifier on a method or a property that overrides a virtual method or property in a base class. This enables you to allow classes to derive from your class and prevent them from overriding specific virtual methods or properties. 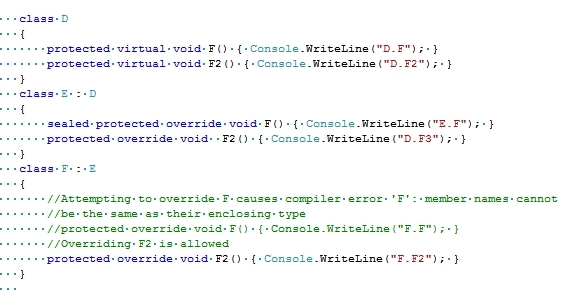 Override redefines a method declared as virtual. Abstract defines a class that cannot be instantiated, or a method that must be overridden in a derived class. Foo.Bar is the Assembly Name which is used for loading. Version=2.0.205.0 is the version of the assembly, also used for loading. Culture=neutral defines culture settings used for string translations and other locale specific settings. PublicKeyToken=593777ae2d274679d is used to uniquely identify the assembly and prevent collisions with other assemblies.